WEST COLUMBIA, SC -- Riverbank Elementary took home top honors in the district's annual Academic Math Bowl. Riverbank Elementary's team competed against Cayce Elementary on Feb. 6. The two teams were cheered on by fellow students, teachers, families, friends and others. Riverbank team members are Yker Baez, Jack Fisher, Kaylee Hook, Stanley Myers, Campbell Parsons and Graham Parsons. Teachers are Annette Blue, Angie Brickhouse, Jennifer Brooks, Megan Grant, Jocelyn Mazzola, Alexandra Theriault, Tracey Washburn, Codee Worthy, Kathy Seibert and Brooke Jones. 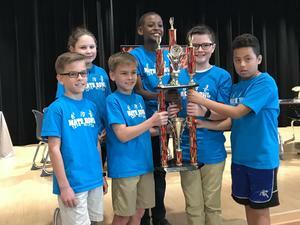 The two teams emerged from a series of math bowl competitions that began in the fall among fourth-grade teams representing six Lexington Two elementary schools. Cayce team members are Kylee Chandlerk, Isaiah Daniels, Jamir Graham, Alex Neal-Guetchkov, DeAndre Thompson and Laney Williams. Teachers are Kendall Carter, Lynn Clendenin, Sara Cummins, Brittany Bundrick, Taylor Phillips, Katherine Sayre and Jessica Dorn.